With Notre Dame leading Michigan by a score of 24-10 going into the fourth quarter, I was fully prepared to suggest Michigan still has a good amount of work to do in order to live up to some of the offseason hype they were getting over the summer. Opinions on the outlook for Michigan were wide-ranging this offseason, but I tended to stay away from forming any real conclusion on them until I saw what they did against Notre Dame. So, after taking a 24-17 lump on the chin in South Bend, what is the opinion now? It’s not quite as bad as you might think. Let’s lay out a couple of quick points right off the bat. Michigan didn’t play a great game at all, and they looked almost unprepared in many facets of the game for the opening game of the season against Notre Dame. The Wolverines were undisciplined with seven penalties for 52 yards, and they had two turnovers in the game, including a Shea Patterson fumble in the fourth quarter that sealed the win for Notre Dame. Last year, Michigan averaged 6.6 penalties per game and ranked 12th in the Big Ten with 21 turnovers lost. It was just one game, but Jim Harbaugh clearly needs to continue focusing on playing smarter and more disciplined, and find ways to protect the football better. These can be correctable areas of the game, so we’ll see what happens moving forward. Good news: This has no impact on Michigan's Big Ten chances. Bad news: Michigan has to win out to make the CFP, which, with these OTs vs. B1G East DLs, not likely. Michigan’s offense sputtered at the start of the game and the highly-regarded defense had no answers for the Irish on the first two possessions by the home team. A 14-0 deficit midway through the first quarter was truly stunning, and those touchdowns count just as much in the first quarter as they do in the fourth quarter. However, it’s what happened since then that may offer a glimmer of hope for Michigan fans. Notre Dame did string together a 15-play, 75-yard touchdown to take a 21-3 lead in the second quarter, but the Irish offense had trouble for much of the rest of the night against Michigan’s defense. The Irish punted six times, had one drive quickly result in an interception by Michigan, and managed to get just a field goal on a 10-play drive. The defense, as expected, kept their cool and kept the game from getting too far out of hand after a devastating start. Michigan’s defense will be just fine this season. After all, Notre Dame had just 68 yards of offense after halftime while Michigan’s defense tried giving the offense every opportunity it could to make a game of it. And, to Michigan’s credit, they did make a game of it, although it was too little too late. Michigan’s success this season will rely on Patterson lifting the offense. His Michigan debut left something to be desired, but he did return to the game after going to the locker room to finish off Michigan’s first touchdown drive of the night in the fourth quarter to cut the lead to seven. Credit Notre Dame’s defense for not making things easy for a new quarterback stepping on the field for the first time against live competition on the road against a ranked team in primetime. 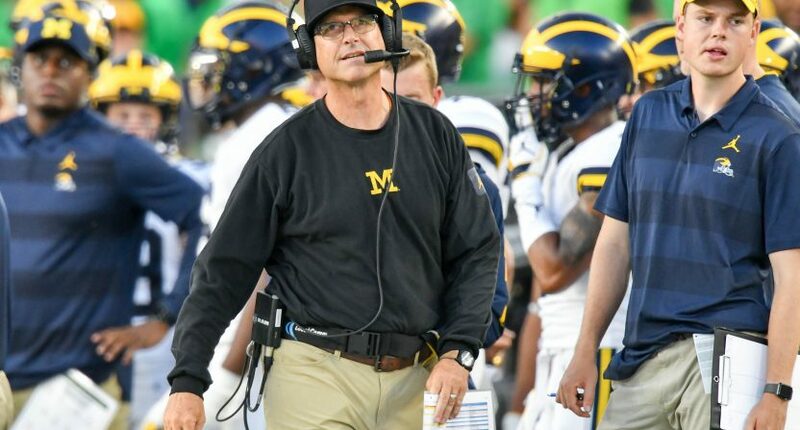 Jim Harbaugh has already made $20+ MILLION coaching Michigan. If he actually believes all his preaching about accountability, he shouldn't accept ANOTHER DOLLAR until he starts performing. Michigan has lost 17 straight road games against AP-ranked opponents. Patterson did end the night with 20-of-30 passing for 227 yards. Only once last year did Michigan have more passing yards in a game (284 yards at Purdue on September 3, 2017), and that was with missing some playing time on the field while being evaluated by trainers. Maybe the offense didn’t improve as much as some had hoped based off of one game, but the time to worry about it will be if things don’t improve in the next two weeks at home against Western Michigan and SMU. It was one loss for Michigan, and that will do nothing but stir up the critics with Jim Harbaugh comments. Opening the year with a loss is tough, but the Wolverines will leave South Bend with some things they know they can improve and take care of, and should feel confident that the offense did seem to find some things that worked late in the game. Next week, at home against Western Michigan, the Wolverines have their chance to improve. What Michigan does in the next two weeks before Big Ten play will be important, because Big Ten play is going to have some stiff challenges.